Here is a very unique design for a trestle table. It’s as close to all natural as you can get. This design is known as a knock down trestle table and features a removable stretcher between the leg bases held in place with removeable tusk tenons. The lumber is 2 inch thick reclaimed heart pine and also features breadboard ends which follow form and function. All that was done to the lumber was sanding, cleaning loose splinters, thoroughly cleaned, and finished with an acrylic satin poly sprayed on. It’s a very beautiful table and looks so awesome in their dining room. They will enjoy it for years to come!! Size is 44 inches wide by 96 inches long. Very nicely done. Love that you were able to keep the saw mill marks. Nice work! Reclaimed and not afraid to show it. Beautiful – I am working on a very similar table only I intend to build it with four legs, not a trestle. Like yours (I’m sure) it will weigh hundreds of pounds. Can you share with us how you attached the bread-board ends? I know from experience that Pine can and will expand quite a lot during the year with humidity. How are you allowing for this? It looks great, sturdy too. Love this table. Nice work. Thank you all for your comments!! I really like working with reclaimed lumber and it certainly has it’s own challenges!!! KnotCurser – I attach breadboard ends in the traditional manner. I have attached pics below. I somehow deleted the rest of the pictures I had that showed the process I use. The next time I do a breadboard, I’ll take more pics. For the table top tenon, I use a router and route both the top and bottom of the main table to center the tenon. I use no less than 1/3 to 1/2 the thickness of the table top to use as the thickness of the tenon. For a better fit, I use a shoulder plane to fine tune the tenon. For the breadboard end, I route a mortise the same thickness as the tenon on the router table. The center hole is drilled and left as is. I don’t drill all the way through the breadboard. The holes on either side of the center hole are elongated to allow the top to move with the seasons. I use the drawbore technique to help ensure a tight fit by offsetting the hole 1/32 inch toward the table. When I go to permanently attach the breadboard, I glue the center 4 to 6 inches only and pin all the holes. 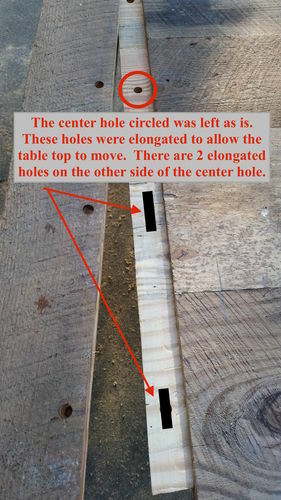 The only glue on the elongated holes are on the top portion of the pins that will seat into the top part of the hole. This allows the table top to remain flat and move with the seasons. I have made some outdoor patio tables out of pine tops which get the extremes of mother nature and they are still true and flat!! NOW I can see the dowels in the original set of pictures – thank you SO much for the additional set of details and explanation! I’m certain that others besides myself have learned a BUNCH from that post. I am “favoriting” this post for certain. Another great looking table. I love the country/rustic look and feel to it. That’s a very nice looking rustic dining table! 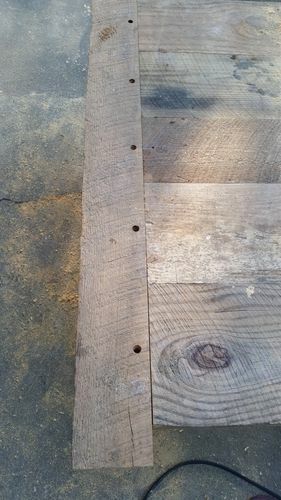 I like the through tusk tenons and wedges you used—and I really like that you saved the mill marks and respected the history of those boards! Mean Dean – I absolutely love all the character in reclaimed wood. The saw marks and any other marks that give the board it’s story is fun to preserve. That’s a nice buck. I think most people mount them on a wall, not the floor. I like the table, too! Wedging that tenon looks great on this table. Wonderful job.